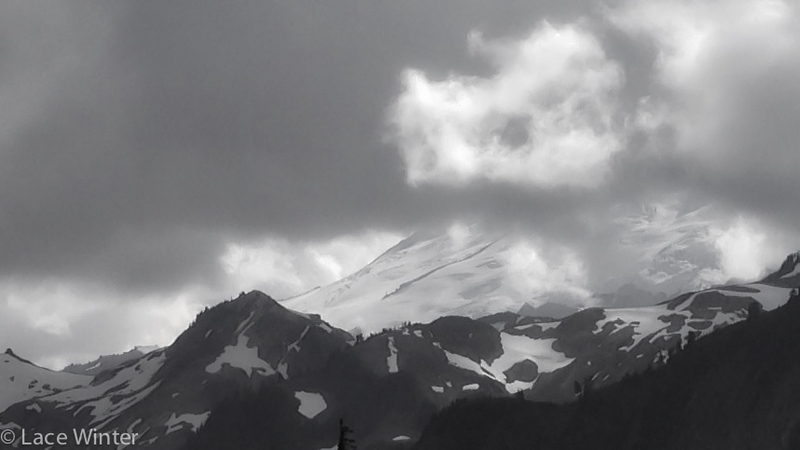 This entry was posted in Photography, The Writer's Life and tagged clouds, mountains, mt baker, pacific northwest by Lace Winter. Bookmark the permalink. I’m well, I’ve just been super busy with IRL stuff! I had to work today, pretty much all day, which wasn’t the original plan. I’m hoping to get some solid writing done tomorrow, as it’s been so hit and miss lately with finding time. How are you? I haven’t even had time to read anyone’s blogs for a few days! Oh no! Serena, I really hope this turns out to be nothing more than a stress reaction. Certainly you have had a lot of stress recently, so I’d bet this is the most likely outcome. Still, I’m keeping you in my thoughts and fingers crossed until you know. Take care of yourself, sweetling. We LOVE snowshoeing up there!! There’s no doubt, it’s a beautiful spot. 🙂 A couple of my favorite hikes are in that area. Do you ‘shoe? I don’t have the knees or back for skiing or snowboarding, but I love alpine activities in the snow! I am planning on a multi-day trek though the mountains either this or next winter. I have to acquire a few more pieces of gear and vet my plans with some more experienced guides (I am probably a bit over-cautious). I love snowshoeing. I love hiking, and snowshoeing extends the season through the winter. I used to do a lot downhill skiing, but it gets so expensive and crowded these days. I still go about once a year, though. I’ve taken up cross-country skiing the past few years, but haven’t really gotten into it that much. I’d be lost without mountains nearby, just as I’d be lost without the sea nearby. Mountains and rivers for me.. I read “Siddhartha” many years ago, when I was quite young. A short but inspiring work, as I recall. Thank you! I actually took this back in August, so it wasn’t really cold at all where I was standing, though there was still some snow on the ground. I love sunny days like anyone else, of course, but somehow mountains seem to need to be seen wreathed in mist and clouds.